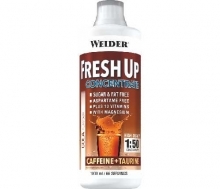 Weider Joint Collagen is a top quality product made of hydrolyzed collagen with a delicious citrus flavour. 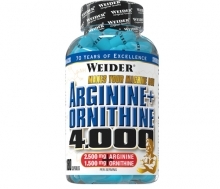 Its ingredients have been selected very carefully to protect and support the recovery of joints. This product is for active and sports people. 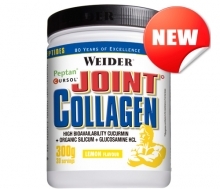 Joint Collagen is not a conventional collagen. The formula has been reinforced with the best functional ingredients, which are used to take care of our joints and protect them……. 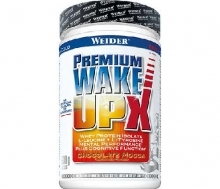 Weider Premium WakeUp is a combination of the purest whey protein isolate together with amino acids, creatine, caffeine and natural extracts such as green coffee and tea. Take this nutritious and functional formula to begin your day with an energized head start. Premium Wake Up X gives you a boost of energy, vitamins and minerals that have a proven effect over the brain function and cognitive performance. Premium WakeUp X comes in a delicious vanilla chai latte and chocolate mocha flavor and is easily in mixed with both cold and hot liquids. It is equipped with excellent nutritional profile of 57% protein, low fat (only 3%), reduced carbohydrates and is low in sugars (barely 1.4%). Premium WakeUp is aspartame and coloring free. 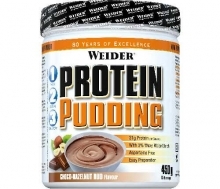 Weider’s Protein Pudding is the best choice you can make if you want to enjoy your proteins without sacrificing the best taste. Our vanilla-flavored pudding, with a hint of caramel, is made with casein, a slow-release milk protein with a high biological value. It's the ideal protein to nourish your muscles for hours and protect them from the dreaded catabolic state. Protein Pudding is perfect as a dessert or at any other time of day, thanks to its excellent composition: 84% proteins and low fat and sugar content. You can have it as a source of proteins with breakfast, or as a protein snack in between meals. Its high protein content will help you care for and protect your muscles as well as to calm hunger if you are on a diet or in a muscle definition phase. 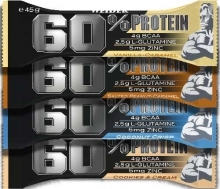 Weider 60% Protein Bar goes a step further and offers the greatest protein percentage contained in a bar, up to 27 grams of protein. Proteins are essential for the growth and maintenance of muscles. They are vital when you wish to see your muscles develop as well as when you want to tone and define. Each bar provides 168 kcal and thanks to its excellent nutritional profile, with less than 5 grams of fat and as little as 0,4 grams of sugar per bar. It is ideal for those who are in the definition phase or in a weight-loss diet. 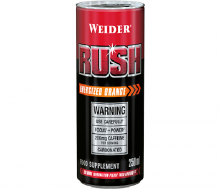 Weider’s RUSH RTD is a pre-training and ready-to-drink beverage designed to increase endurance, achieving maximum performance and taking your training to the next level. RUSH RTD contains an exclusive combination of carefully chosen ingredients that will help you get more energy and strength than you ever imagined. Thanks to this drink you will be able to increase muscle development, and improve your focus and motivation during workouts. 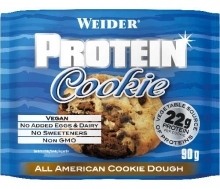 Weider Vegan Protein Cookie is a Delicious energizing cookie with excellent protein content. The smell of freshly baked cookies is just mouthwatering. 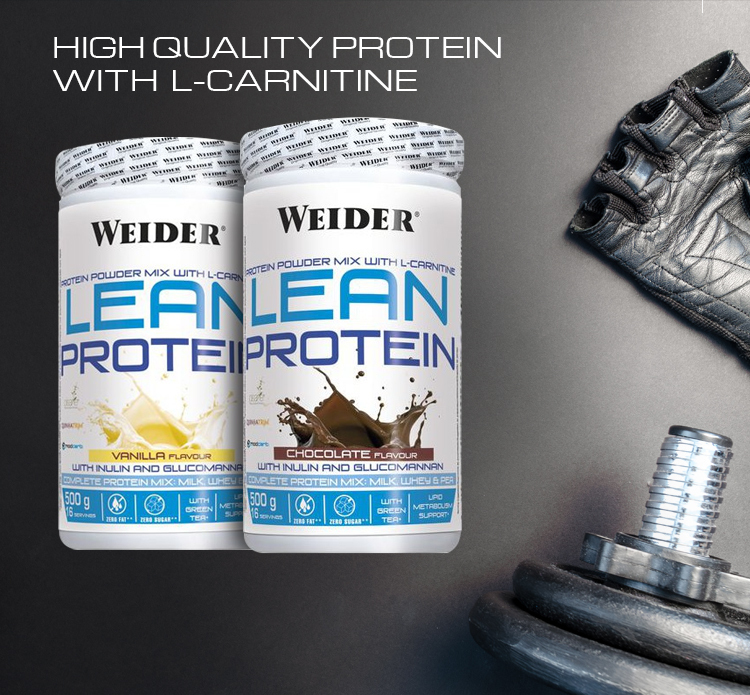 Weider’s Protein Cookie is not only a delicious snack; it is also an extraordinary source of plant protein. Rich in nutrients, carbohydrates and proteins Protein Cookie aids in muscle mass growth and repair. To reach the anabolic state our diet needs to be hyperenergetic and hyperproteic. Easy as it may seem, obtaining the necessary energy and nutrients to stimulate muscle growth is not a simple matter. Especially if we speak of healthy energy sources. 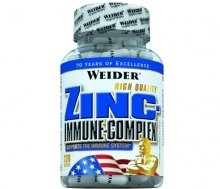 Weider Zinc Immune Complex Caps contains high quality zinc compound aimed at supporting the immune system and metabolism. The capsules only contain Zinc Gluconate, a source of zinc that is particularly easily absorbed. Zinc plays a major role in activating countless enzymes and is therefore responsible for controlling the carbohydrate, protein, fat and nucleic acid metabolisms. In addition, zinc is an essential trace element that is important for the healthy functioning of different hormones. 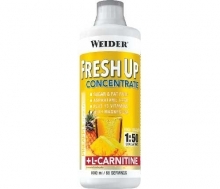 Weider Fresh Up Concentrate with L-Carnitine: Sugar & Fat Free beverage concentrate for preparing a low calorie thirst-quencher with vitamins and minerals in a range of delicious flavours. 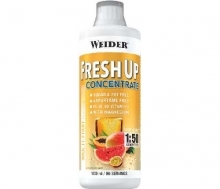 Weider Fresh Up Concentrate: Sugar & Fat Free beverage concentrate for preparing a low calorie thirst-quencher with vitamins and minerals in a range of delicious flavours.